The Lady from the Lady and the Unicorn series of medieval unicorn tapestries is seen here emerging from the royal pavilion, and reaching for her jeweled necklace from the jewelry box attended to by her hand maiden. The work shows a hint of the joyful mille fleur background in red, dotted by flowers and wild animals. 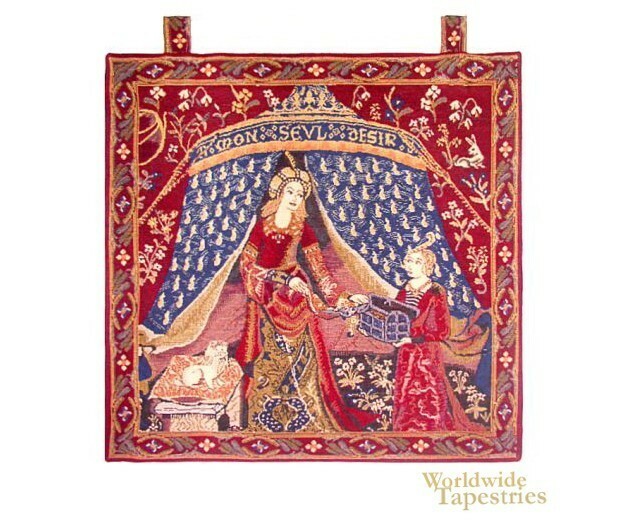 This unicorn art tapestry "A Mon Seul Desir Detail - with loops" is backed with lining and has loops for easy hanging.